The Sun position determination is required in several solar applications, within them is the Sun tracking. The Sun position is determined in this chapter with reference to the Earth's center and with reference to an observer on the Earth's surface. This procedure allows determining the possible relationships between different solar angles. The determination of the solar rays' incidence angle on the surface of different orientations is very important for determining sunshine duration on this surface as well as global solar radiation received by this surface. The obtained formulas could be used for determining the optimum tilt angle of solar receiver. Some procedures for measuring site latitude, solar elevation angle, solar zenith angle, hour angle and solar azimuth angle are presented. Some devices used in measuring sunshine duration are also described. 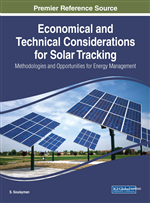 The main systems of coordinates used in solar tracking are introduced. The provided information will be essential background for different types of Sun tracking. Before determining the Sun position in relation to the Earth’s center or in relation to the Earth’s surface, basing on different resources (Tian Pau Chang, 2009; Roberto Grena, 2008; Roberto Grena, 2012; Manuel Blanco-Muriel, Diego C. Alarcón-Padilla, Teodoro López-Moratalla and MartÍn Lara-Coira, 2001; Parkin, 2010) it is important to define some angles. The azimuth angle and the elevation angle at solar noon are the two key angles which are used to orient photovoltaic modules. However, to calculate the Sun's position throughout the day, both the elevation angle and the azimuth angle must be calculated throughout the day. In order to determine the Sun position in relation to Earth’s center or in relation to an observer on the Earth’s surface it is important to define two groups of angles (Kittler and Darula, 2013; Duffie and Beckman, 2013).